I’m 2m away from a man with one of the world’s most dangerous jobs. 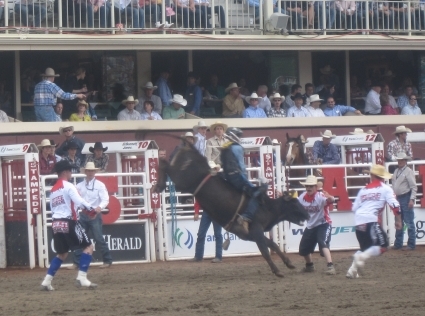 A day in the office for 24-year-old J.B. Mauney involves hopping on the back of one tonne of muscle, hoofs and horns and trying his hardest to stay there for eight seconds. After which he has to get off without being trampled or gored to death. To psyche himself up, he’s hitting himself, hard and repeatedly, in the arms, legs and head. It’s an unusual but effective technique. He’s won the event for the past two days running. This entry was posted in Canada by Rob McFarland. Bookmark the permalink.